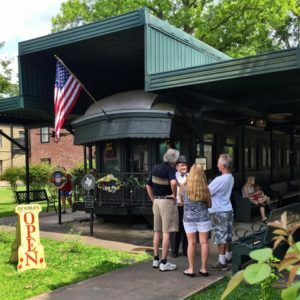 You will enjoy four destinations throughout downtown for the 6th Annual Jefferson Texas Train Days. This is a wonderful family event or for train enthusiast of all ages. Jefferson Train Show at the Visitors building where you can watch beautiful operating model train displays and layout s and visit with model railroading club members. You will want to peek inside of a few of the buildings on display and see the miniature details inside. And then see the tables of trains, parts and accessories for sale. You’ll be sure to find something special from the vendor’s onsite. Admission $6. Children under 6 FREE. Then step outside and you can then watch the Stem Whistle blowing, it is a hoot. Pun intended! 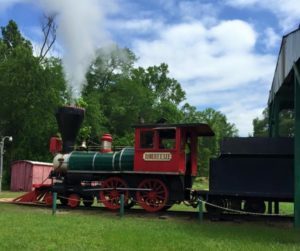 Then travel through town again to the Jefferson Historic Railway for Steam hissing, whistle blowing and pistons chugging, the live steam train recreates the golden era of steam railroading with a historical tour along the beautiful Big Cypress Bayou. Enjoy rough and ready cowboys aboard the train, complete with cannon, gunfights, and a train robbery, on every train. There will be plenty of time to participate in the Jefferson Train Days & Model Train Show. Combo Tickets available online for all four destinations: Jefferson Train Show, T&P Model Train Depot, Jay Gould Car and Historic Jefferson Railway. Tickets available at each venue during event weekend. 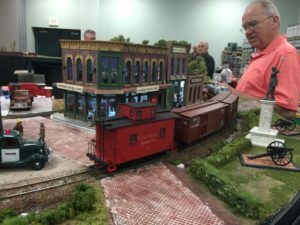 This entry was posted in Spring Events and tagged Hobby, Museum, Train Ride by Tammy D. Bookmark the permalink.